October | 2017 | Bluffton Lodge #145 F.&A.M. 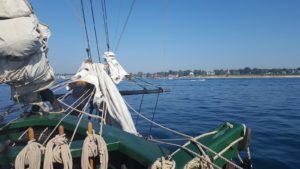 Is that your ship yonder? No, just a big thank you to the Brothers who worked diligently over the last several month practicing and fine tuning their ritual for the Grand Master’s One Day Class. Their performance of both the first and second sections with such precision and decorum showed that Bluffton Lodge is on the top of their game. A hearty thanks to our Brothers for representing Bluffton Lodge in such a fashion! 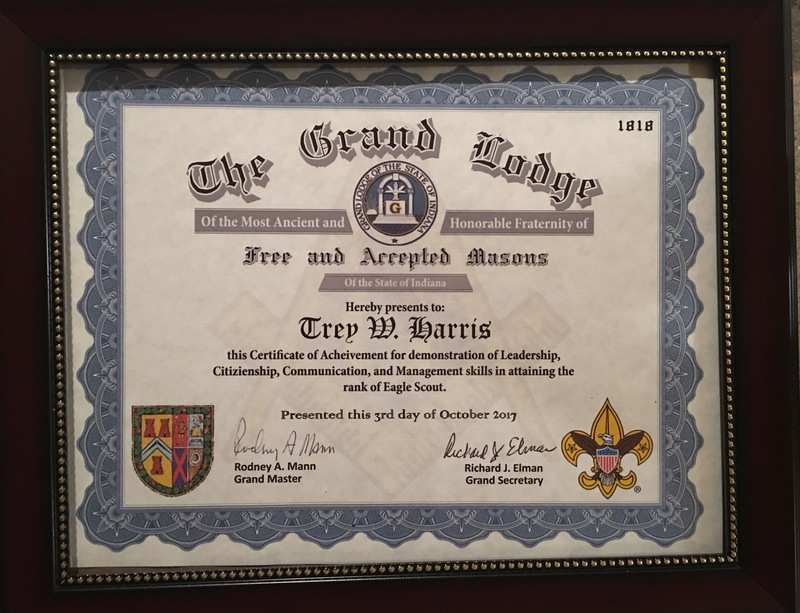 Speaking of degree work, Bluffton Lodge will be conferring the Entered Apprentice Degree Wednesday, October 25th at 6:30 P.M. Please come out and enjoy great degree work and help another young man start his journey into the Fraternity. A light meal of soup and sandwiches will be served after the degree. Please note that the November Stated Meeting will be on November 7th. We will be holding our annual elections so please make a note on your calendar to attend. Dinner will be served at 6:30 p.m. and the Stated Meeting will be at 7:30p.m. Menu for Dinner will be roasted Pork Loin, potato and vegetables, salad, and dessert. Please join us for an interactive evening with brothers. I want to congratulate the brothers who participated in the 3rd degree at the shrine building in Ft Wayne on Saturday the 14th of October. They did an outstanding job! They not only performed the degree with precision but also with a professional approach which would have caused any lodge to stumble. From stepping in to fill spots on a moment’s notice , even while the degree was being performed, to continuing without hesitation when technical difficulties had the lights turning off and on without notice. No one let the confusion effect their work and performance throughout the entire degree. My hats off to everyone who represented Bluffton 145. Coming up on Wednesday October 25 is an EA Degree and a reminder that we are participating in the boo in Bluffton on Tuesday October 31 at Bluffton city gym from 5:00 to 6:00 handing out candy to everyone who comes through. Just a reminder that the 2018 dues notices will be arriving in the next few weeks – please keep an eye out. If you have any questions or concerns, please call or email the Lodge and we will do our best to address them promptly. 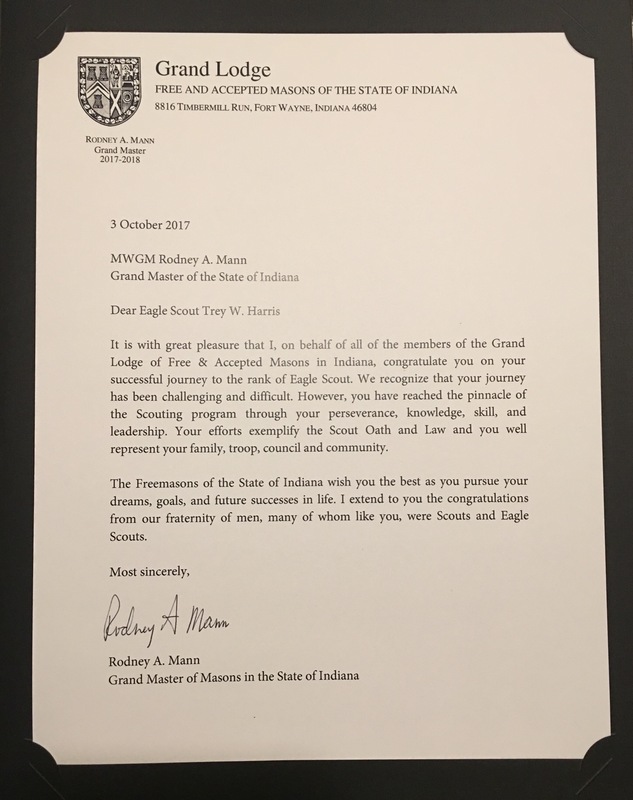 October 31st – Boo in Bluffton @ City Gym @ 5 p.m. – 6 p.m.
November 11th – Scottish Rite Fall Convocation @ Mizpah Shrine in Fort Wayne, IN. 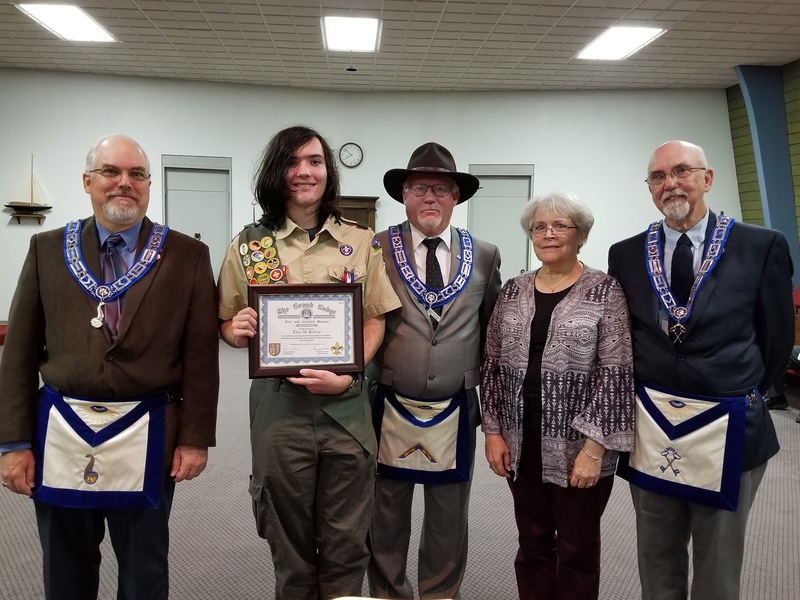 Bluffton Lodge 145 presented Eagle Scout Trey Harris with the Indiana Masonic Eagle Scout Award from the Indiana Grand Lodge.